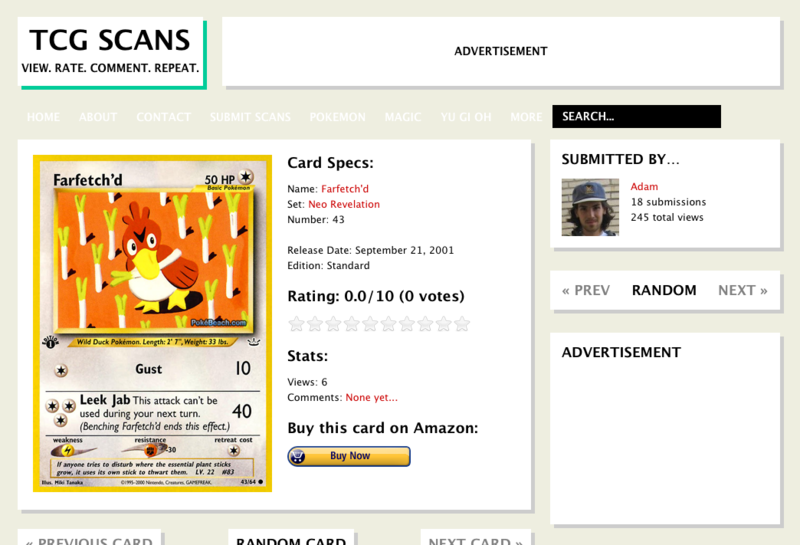 PkmnCards began as an idea of mine during the endless summer of 2011. There were (and still are) many places around the web where you can find images of Pokémon cards, but in most cases either (A) the source will have placed a watermark on the image, detracting from its aesthetic appeal, or (B) the image will be of low resolution. My goal was to create a website where you could easily access high-quality images of Pokémon cards for reference and viewing pleasure. I also wanted to make the experience interactive by allowing visitors to rate the cards and spark discussion with other Pokémon fans. Its ethos was to be fast and fun. Originally, I planned to host images from all trading card games, and accordingly named the site TcgScans (scans is another term for card images), but I soon realized this would be too ambitious of an endeavor to see to even partial completion, and the site was rebranded and realigned as PkmnCards at the start of 2012. Pokémon cards would be the sole focus from then on. My heart has always been with the Pokémon TCG, anyway; I played competitively from 2004–2008, contributed to the Queendom deck that won Worlds in 2005, and founded SixPrizes in 2009. Despite all the prefacing fanfare, PkmnCards started simply. 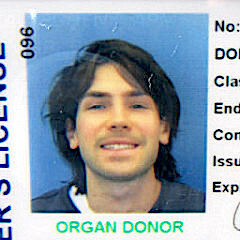 It allowed searches only by card name and exhibited a crude layout, but it gradually expanded in terms of complexity (as I became more adept at computer programming) to offer advanced searches, multiple archive displays, sorting options, and more. 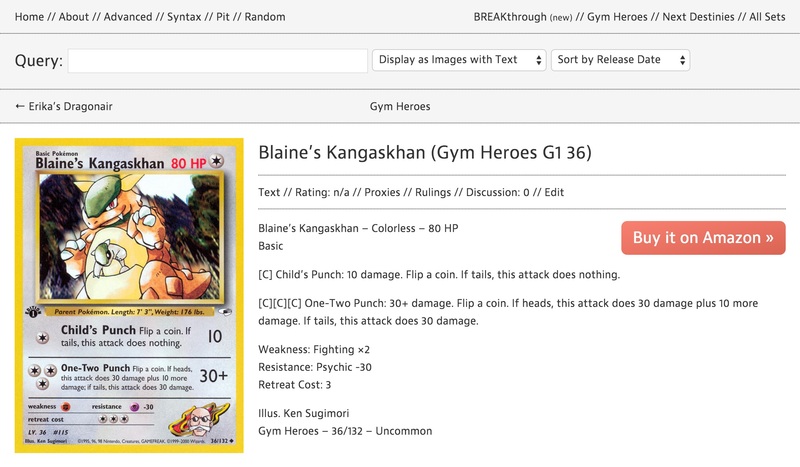 PkmnCards underwent a massive recoding process in February 2013 to mimic the outstanding Magic: The Gathering reference website, MagicCards.info, which set the foundation for much of the functionality you experience today. In 2015, the codebase was revised over two (or so) weeks to correct my most egregious coding errors in efforts to lessen the burden on the server, and in October 2018 it underwent another intensive, month-long audit to improve all aspects of the website, mostly notably those related to design, performance, engagement, and discovery. With that, my continual goal, as it has been from the beginning: I want for this to be the website to view Pokémon cards quickly, easily, and enjoyably. So far, so good. A vast majority of our beautiful card images pre-HeartGold & SoulSilver come via Martin of Pokémon Paradijs. Thank you, Martin! The card images from HeartGold & SoulSilver and onward have almost all been gathered from PTCGO by snoops, who also maintains the LackeyCCG Pokémon plugin, and nago. Thank you, snoops and nago! Jimmy of the Kemony stream has also kindly contributed PTCGO images at times. Our World Collection images come courtesy of Kate P., and the remainder of our images over time have come from sources like Bulbapedia, Pidgi.net, PokéGym, Pokemon.com, PokéBeach, and Troll and Toad. The PTCG symbols come from icycatelf’s PTCG font. Translations of Japanese cards are sourced from Bulbapedia. 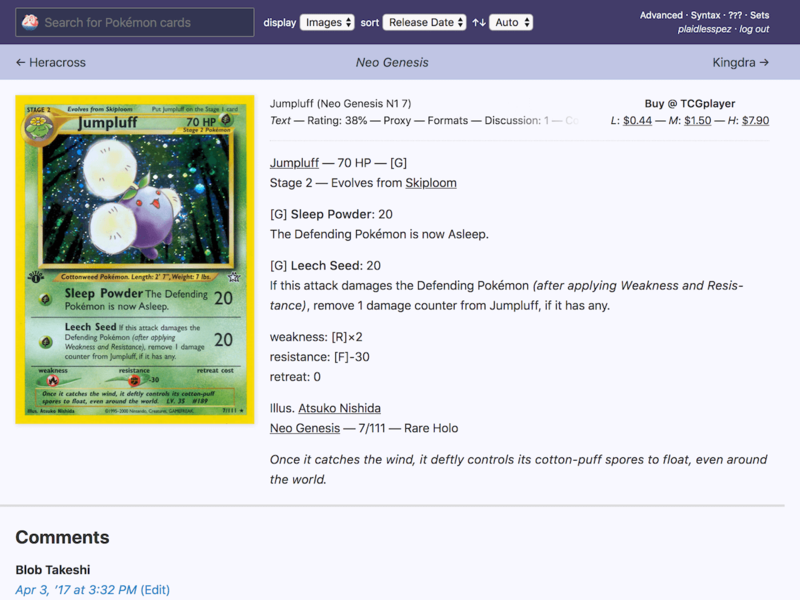 PkmnCards was built using WordPress, a custom Genesis child theme, and as few plugins as possible. The codebase is currently private. I pay TigerTech for web hosting. The PkmnCards database is unavailable for download and likely will never be made public. The website uses WordPress for its backbone, and I’m not sure the data in this state would be of much use to anyone, anyway. An API, to allow practical retrieval of information from the database, is also unavailable. I have been approached about creating an API in the past, but I haven’t had the motivation to build one. If you would like to bulk download card images for personal use, there is a Chrome extension called Image Downloader which I’ve been told will allow you to download all of the images from a single page at once. I have also made available a shared Google Drive folder, which contains many—but not all—of the sets compiled as zips. From Sep ’16 until Dec ’18 a Special Thanks list, which acknowledged our top monthly patrons, was included at the bottom of most pages on PkmnCards. This reward is no longer available, but I’d still like to express particular gratitude to these users, listed above, who were active for the final iteration of the list.